As stock indices continue to soar to all-time highs and painful drawdowns remain scarce, investors have begun to question the value of active strategies. They also appear to be voting with their pocketbooks; in the first half of 2017, fund flows out of actively managed portfolios into passive vehicles reached $500 billion. A June research report from Goldman Sachs observed poor recent performance by traditional value investing strategies and concluded that, while there may still be some long-term benefit to these strategies, the short-term environment looks bearish for value stock picking. That observation is echoed by ex-Bridgewater quant Maneesh Shanbhag, who recently told Bloomberg that most traditional factors “are largely priced in and can’t help differentiate between the winners and the middle of the pack.” The chart below illustrates this view; a traditional strategy of going long the least volatile stocks no longer produces meaningfully better performance than buying the other deciles; there’s only meaningful upside left if one is able to short the most volatile stocks against such long holdings. It could simply be that public markets have gotten smarter. A paper by R. David McLean and Jeffrey Pontiff published in the Journal of Finance in 2016 shows that, after academics publish research that identifies pricing inefficiencies, returns to those strategies fall by 32%. Bigger mispricings are more likely to survive after they’re revealed in publications, and mispricings tend to stick around more in less-liquid, riskier stocks. “Our findings suggest that investors learn about mispricing from academic publications,” the authors say, though they also conclude that asset mispricings fail to completely disappear after they’re revealed by academics. Market participants learn from research, but not all the way. 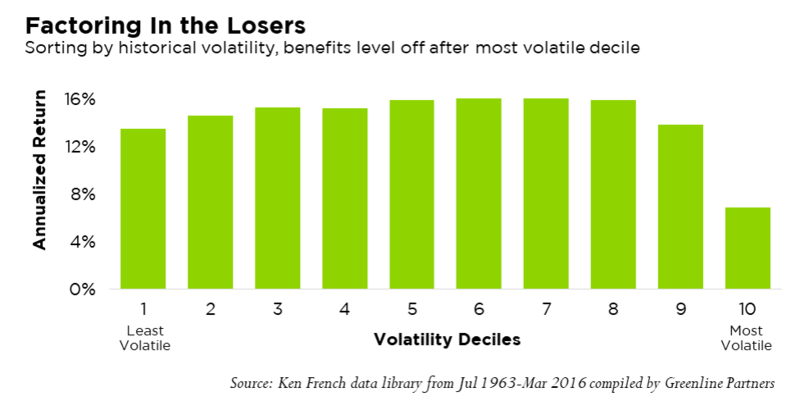 Mclean and Pontiff’s findings are largely consistent with the traditional view that opportunities to outperform eventually fall victim to market efficiency. Lately, the U.S. stock market has seemed to agree. Year to date, the only smart thing smart money seems to have done is go short volatile stocks. The past quarter has been particularly rough for factor investing; April was unremarkable, May was mixed, and almost nothing worked in June. Factor investing has been underperforming historical expectations, and lately investors in US stocks would have been better off leaving these strategies alone. The below table using data from S&P Capital IQ illustrates the point. Year to date, highlighted in yellow, most factor categories have moved adversely compared to recent and long term averages. Recent factor performance shown from below factor styles is similar to factor exposures within the Fund. However, as of late, returns to factor investing have been much more attractive and consistent with their long term return profile in international stocks. And over the long term, the annualized returns to factor investing have been relatively attractive and generally more consistent vs. US domestic performance. In sum, the data largely support the narrative: Outperforming indices is a competitive business, especially in long-only US stock strategies. Wherever a fund is investing, decisions must be implemented efficiently and with substantial attention to management of downside risk. Tactical Equity has made adjustments in light of these observations. The Fund has added a substantial weighting to international stocks in the long-short portion of its portfolio, and it has optimized the risks it takes relative to expected reward by seeking to largely eliminate currency and industry exposure. These improvements are designed to make the investment experience a “smoother ride” while pursuing returns from individual stock mispricing. Markets, especially U.S. stock markets, always have some degree of efficiency, and pursuit of factor-driven outperformance can be punishing in short term periods, as we’ve lately seen. Furthermore, the timing of downdrafts to factor or “anomaly” based investment strategies is generally uncorrelated with what the broad market is doing at any one point of time. However, research shows that markets are not fully efficient, even after mispricings are revealed to investors. With careful attention, investors can still identify opportunities to outperform for the long run. The critical ingredients to long term outperformance, in our view, is careful attention to risk management and an ability to identify and implement new strategies as academics discover them. The Counterpoint Tactical Equity Fund continues to prioritize both of these activities. There is no assurance that the Fund will achieve its investment objective. Mutual Funds involve risk including the possible loss of principal. The use of leverage by the Fund or an Underlying Fund, such as borrowing money to purchase securities or the use of derivatives, will indirectly cause the Fund to incur additional expenses and magnify the Fund’s gains or losses. Derivative instruments involve risks different from, or possibly greater than, the risks associated with investing directly in securities and other traditional investments. There is a risk that issuers and counterparties will not make payments on securities and other investments held by the Fund, resulting in losses to the Fund.